You remember when we told you about that Verizon ad that poked fun at the iPhone's "there's an app for that" commercials? By putting up two maps comparing Big Red's large 3G coverage with the more spotty AT&T 3G coverage, a off-screen voice says that if you're wondering why your Verizon phone works at 3G speeds while your friends' AT&T device doesn't, "There's a map for that". According to the New York Times, AT&T has filed a suit in the Northern district of Georgia where it's wireless headquarters lie. The suit complains that the AT&T coverage map used in the ad makes it appear that the carrier offers no service at all in the non-blue areas of the country where AT&T does not offer 3G. The truth is that AT&T offers service in those areas, albeit slower than 3G. 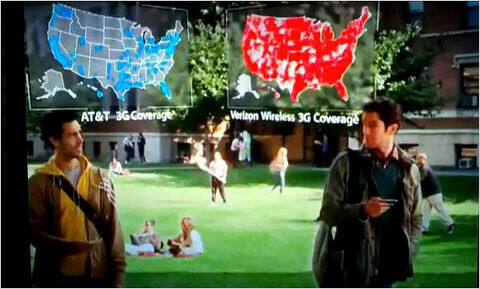 The first version of Verizon's spot said that AT&T customers out of the blue 3G region were "Out of touch." After the carrier complained, the copy was changed and superimposed on the screen are words that say, "Voice and data services available outside 3G coverage areas." AT&T still feels that the ads are misleading and points to a survey done in a mall where 53% of those asked responded that they thought the maps showed that there was no AT&T service at all in the non 3G locations on the map. A Verizon spokesman, Jim Gerace, puts forth the argument that AT&T's own ads are misleading. "We believe this action by them calls into question the validity of their own claim of fastest 3G network," said Mr. Gerace. "They are misleading customers by inferring that the fastest 3G network is much bigger than the blue" area on the map. In response, Mark Siegel, an AT&T spokesman, said, "Verizon began this whole campaign largely in response to the fact that we are the leader in smartphones." The suit is being brought under the Lanham Act which bans trademark infringement and false advertisement. "There's a map for that!" This will go no where...its obviously says 3G on it. That doesn't mean they have to show a 2G map too. Really, *HOVA*!? Are we really so naive that although it clearly states "3G Coverage", Verizon Wireless is eluding to stating that you either ge 3G or nothing? You must be the fanboy of all fanboys with that terrible statement. And honestly, even though VZW didn't say it, if you're using an iPhone 3G specifically, we're educating those customers that the 3G branded device only gives you 3G coverage in very few areas. Verizon Wireless has finally taken the gloves off and is now on the offensive. Maybe At&t can hire another celebrity spokesperson to say otherwise! Stop wasting money on mediocre celebs and upgrade the network! VZW FTW and there's a map for that! You can refer to my post #17. Just because the people on this forum get it, does't mean the millions of morons who see the commercial does. Nice try though. Once again, you're a follower of idiots with no real comment. Well it doesn't really matter what happens now. Even if AT&T wins the suit (which I think they will), the damage is already done and Verizon accomplished what they sought out to. At&t doesn't have a case to win any suits. It's obvious that Verizon Wireless is comparing 3G Coverage and coverage alone. What could you possibly say that is false advertising!? And you call ME a fanboy of fanboys?? Just because I can step back and look at things objectively and you can't doesn't make me a fanboy. I don't have AT&T so why would I be a fanboy of them exactly? That would be like calling you an Alltel fanboy when clearly you have VZW. That doesn't make sense, but your comments never really have so... Carry on!! I completely agree with all of the above posters. Verizon is using smart marketing and THAT is what really scares ATT. HA! And you know almost everybody in the country has already seen the ads and agreed with them I'm sure so its a moot point even the WAY OUTSIDE chance ATT would even win a fight like this. We all already know. But understand why AT&T is suing Verizon. Sure the commercial is saying 3G, but think about it. 1X and EDVO Rev A is also considered 3G by Verizon. AT&T never called it's EDGE network 3G, since it technically is, but they called it 2.5G. AT&T is angry because the map on the Verizon commercial leaves the viewer to believe that if their area isn't blue, they have no data coverage, even though they do. I know I'm going to get thumbbed down for my comment for defending my network, but I'm just looking at it from both points. I know that if I was an average customer that didn't know what 3G was, then I too would believe that since my area isn't blue that I wouldn't get data. Verizon says 1x and EVDO are 3G because their entire 1X network IS EVDO whereas AT&T has "dark blue and light blue" coverage areas for their 2G and 3G networks because not all of their 2G netwok offers 3G service. Its just sour grapes for AT&T. They have no other way to defend their coverage, but instead of spending all this money on a frivilous lawsuit, how about build a tower somewhere and beat Big Red the old fashion way...through real industry leading network coverage expansion. The whole purpose of this marketing campaign is a spoof on AT&T's commercials that claim their "i'm Bill Curtis, and I'm faster than Michael Phelps". Like VZW said, those commercials are more wildly misleading in making people think that 3G coverage is available everywhere. I think AT&T customers should get together and start a nice class action, Big Red should donate to the legal fund. This is true to all that have no clue what 3g is. It was obvious to me and I'm sure many others that it was just comparing their (3G) Data coverage. Not any slower speed they might have. ATT is just fussing becuase they can. All Verizon has to do is put in fine text at the bottom of the commercial that say "These maps only repesent 3G data coverge, not the total coverage of the carrier." or something like that. ATT is just doing dirty work here. If they wanted to get back at Verizon then they should just make a Ad of their own. But there is one small problem they would be helping Verizon if they made a coverage map becuase it would just show the same thing, but add 2 or 2.5G coverage to the map. I hope one thing is that if they win the suit them I sure hope they use what ever they get to improve apon their network. I would lover to have an Iphone, but their Edge speeds all around me for at least a 100 miles are too slow for me. But Verizon on the other hand gets fast enough speeds where every for web browsing and even video stearming. When talking about phone coverge both carrier's are great, but when it comes to data coverage Verizon will always win. Spint even has the upper hand as well. If this suit passes, it will set a precedent that advertisements not only must be factually accurate, but not be mis-interpreted by the moron masses. Think AT&T is shooting themselves in the foot on this one, lawsuit is bringing more attention to the commercials. Do you guys actually read these articles?? I am about 3 months away from getting my law degree so I decided to bring this to a couple of my professors. They decided to talk about it in class and show how it was a totally legal commercial because of the title of the map saying 3G coverage and not data coverage. I think I'll take their word for it. I guess they never learned that Sega does what Nintendon't... Really, the map says in BIG LETTERS 3G coverage.. It isn't like they hid it in small fine print that comes and goes quickly. You really think the average person these ads are targetting are smart enough to figure that out?? If so, you need to work for a wirless carrier for a while. You'll soon find you're sadly mistaken... I had a guy yesterday tell me he was mad because ATT's 5G coverage wasn't fast like he was told... We know because we're educated, most customers are idiots when it comes to this stuff, lets be honest.